While the sample of countries in the table below is far from complete, it is a highly important sample of the industrialized trade-oriented countries. A simple diffusion calculation across the countries in the table shows that most are having output weaken over all horizons in the table. However, the more complete and weighted global index shows that output globally has still been expanding but not with any vigor. 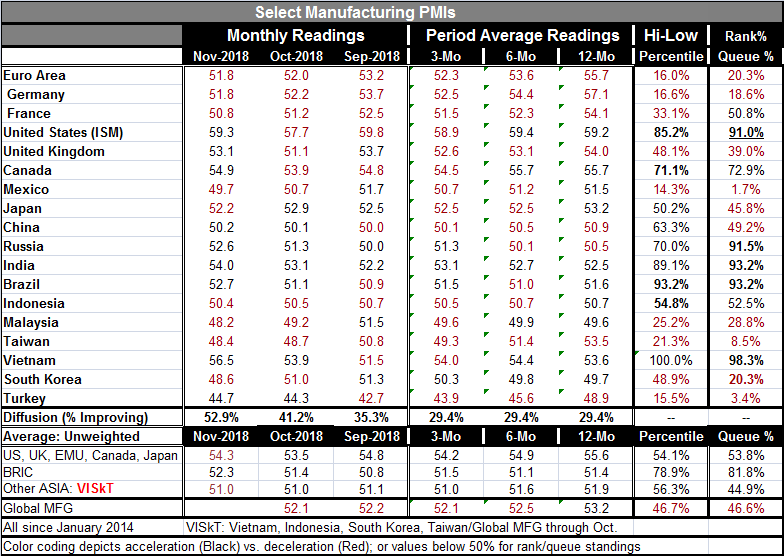 Ranked in a queue of data the global MFG reading through October has only a 46.6 percentile standing which leaves it below its median calculated on data back to January 2014. Nonetheless, in November the diffusion index count of countries with diffusion improving has actually poked its head above 50 at 52.9%. Still, global manufacturing has been weakening; different measures will produce different metrics on how much weakening there has been. Yet, what is clear is the trend and also the breadth of that trend. Over three months and six months and 12 months, most countries in the table are showing net weakening in manufacturing output as measured by diffusion indexes. Over those three time frames, less than one-third of the diffusion indexes show improvement; over two thirds show deterioration. In November, of the 18 readings in the table, four are below 50, signaling outright contraction. Four others have values below 51, less than one diffusion point above neutral; that's eight out of 18 that are exceptionally weak. October has three readings below 50 and two additional readings below a value of 51 plus one exactly at 51. September finds China and Russia at 50, Turkey below 50, and three other countries with readings below 51. On a weighted index, the strength in the U.S. tends to carry the day. The U.S. manufacturing diffusion metric is at a robust 59.3 in November (ISM gauge), a 91st percentile queue standing since January 2014. Vietnam, Russia, Brazil and India have higher percentile standings but on much weaker diffusion readings. They are strong relative to a weak recent history. The U.S. gauge is strong in absolute and relative terms. But Asia still shows a great deal of weakness. This is not surprising given its reliance on export-led growth and the assault on free trade. Turkey, Mexico and Taiwan have percentile standings for their November diffusion indexes in single digits (below 10%). Below a 30% standing are Malaysia and South Korea as well as the whole of the euro area and Germany (separately). Below 50% are Japan, China and the U.K. Above a 50% rank or queue standing are France (50.8%), Indonesia (52.5%), and Canada (72.9%); at strong readings are the U.S., Russia, India, Brazil, and Vietnam. Five of 18 are really strong in relative terms. Canada is quite firm. France and Indonesia are middling. It's not a great record and shows international bifurcation. The U.S. is doing well and its trade adversaries are not. Right now countries dependent on export-led growth are getting whacked with Vietnam, the newbie in that regard, the only exception (and riding its 'all-time' high reading on this timeline). The high queue standings for Russia, India and Brazil (averaging 92.7%) correspond to an average diffusion value of 53.1. By contrast, at a diffusion reading of 53.1, the U.K. has a 39th percentile standing on the same timeline. It is hard to argue that on these metrics Donald Trump has not made America 'great again.' Of course, this is a very limited sample a short-time period and many caveats are due before we crown U.S. economic policy 'king' (which it surely is not- there is a lot to be done before such a crown is earned). But Trump's view-in-motion has harmed other countries more because changes to this system will hurt them more. And that is because they have gamed the system and systematically taken advantage of the U.S. and of U.S. willingness to play the role of a bigger wiser more affluent brother to everyone. Make no mistake about it, all these other countries have run a me-first policy all along. They are just shocked that the U.S. is willing to kick them off the gravy train and make them fend for themselves- to earn an honest living. I think we are about to find out who are real allies and who have just been parasites. And while the U.S. is still rich, its policies have diverted many of its resources abroad. The current account deficits that it runs with persistence are the result of both unfair trade and slippage in its competiveness, something it must get back on its own and cannot be won by arguing over trade rules with China or anyone else. It is popular to be opposed to the President these days. But his positions on Free Trade and on our allies' need to act as allies and provide support are laudable goals. Trump may have over done it and need to add to foreign aid given the way that China is trying to insinuate itself into power by enticing countries with loans that seem to be helpful but in many cases have turned out to be a fretful, cloying, spider web of entrapment. The U.S. still has a long way to go to offer or develop an approach that comes close to being as good as free trade. But for now the goal is politicized to create a better outcome than the current system which is not at all free-trade based and is slanted against U.S. interests. Improvement should not be hard to come by. If this were surgery, we would be talking about a series of needed operations before full health were to be restored. U.S. trade partners are going to be angry about losing the advantages they had under the previous arrangement. But that alone does not make the U.S. approach wrong. Still, it underlines why there will continue to be hostilities and we have not yet heard anything from the U.S.-EU negotiations on trade and we know how the EU has treated the U.K. in Brexit. We should get prepared for a lot more acrimony in our future. Yes, the G20 concluded its meeting in Argentina without starting a trade war as the U.S. and China both backed down. But don't kid yourself about the road ahead and its risks. And remember that there is not just trade on the block but a lot of geopolitical disagreements as well.